My favorite holiday is officially over. I love Thanksgiving. I just love what it stands for….a gratefulness of abundance, celebration of the gifts of the Creator, a gathering around the family dinner table, keeping all other distractions out for a moment. The whole day, from beginning to end, is a focus on thankfulness for blessings. But, I also love that Thanksgiving is like an announcement to a joyful holiday season. And, the beginning of this sandwich. 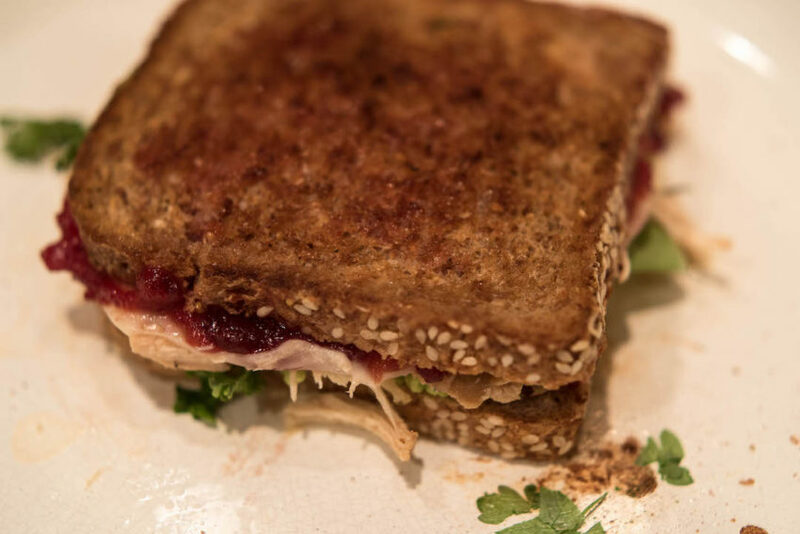 It’s like a post-Thanksgiving panini. Of course it can be made any time, but it has all the great flavors of fall, and uses ingredients you usually have around after Thanksgiving. We have made it four times already! Everyone loved it, so I thought it was definitely worth sharing (like a foodie version of a Christmas gift). 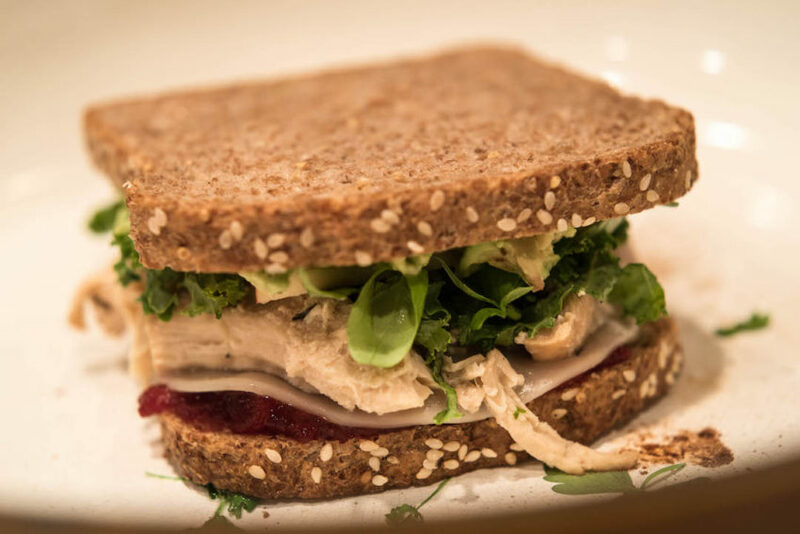 So, here’s a step-by-step guide of my favorite fall sandwich…the Turkey-Avocado-Cranberry Panini. 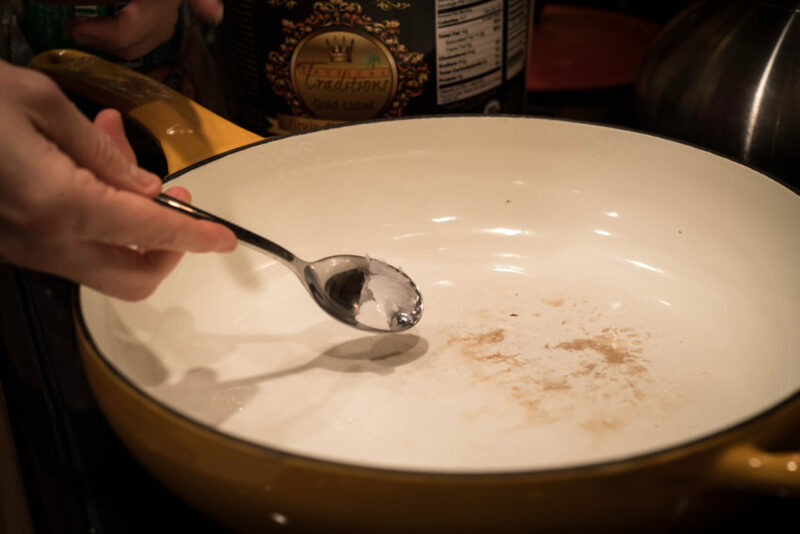 Put a small bit of coconut oil in the bottom of a skillet…and swirl it around a bit. Then place down a piece of good, hearty bread. 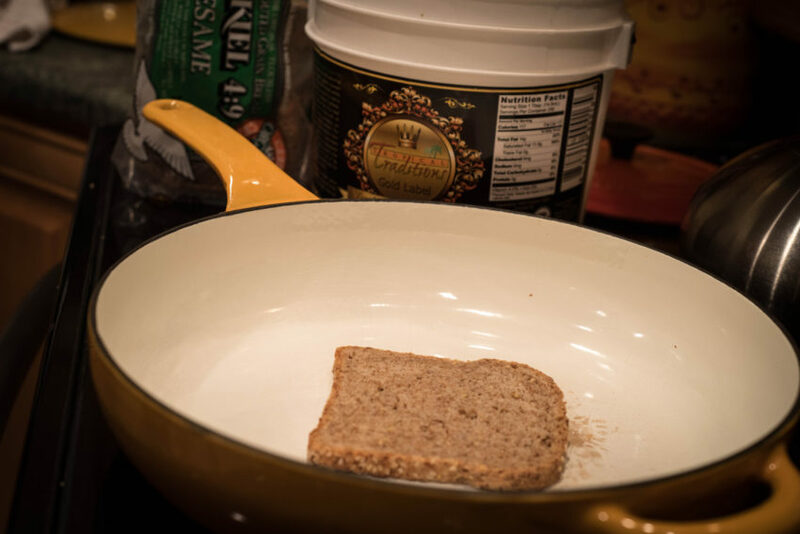 I love using sprouted-grain bread, such as Ezekiel’s. 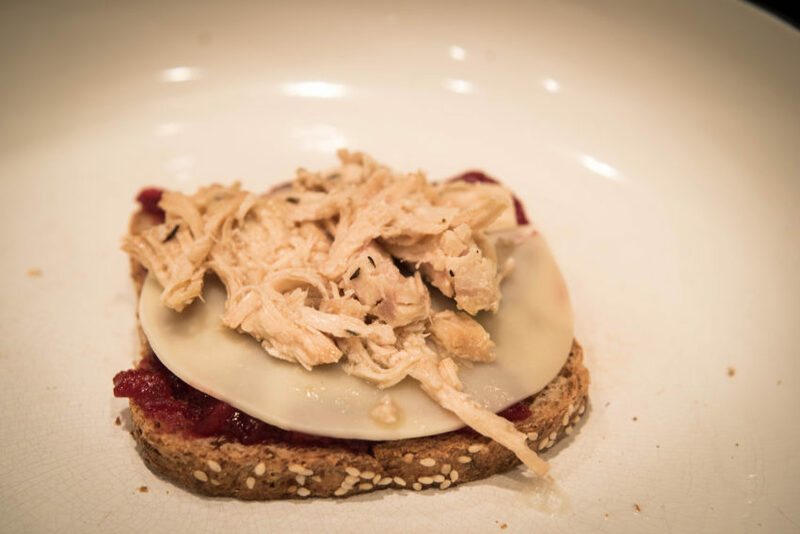 It’s hearty, chewy, and toasts great. Let it cook over medium heat while you build the sandwich. 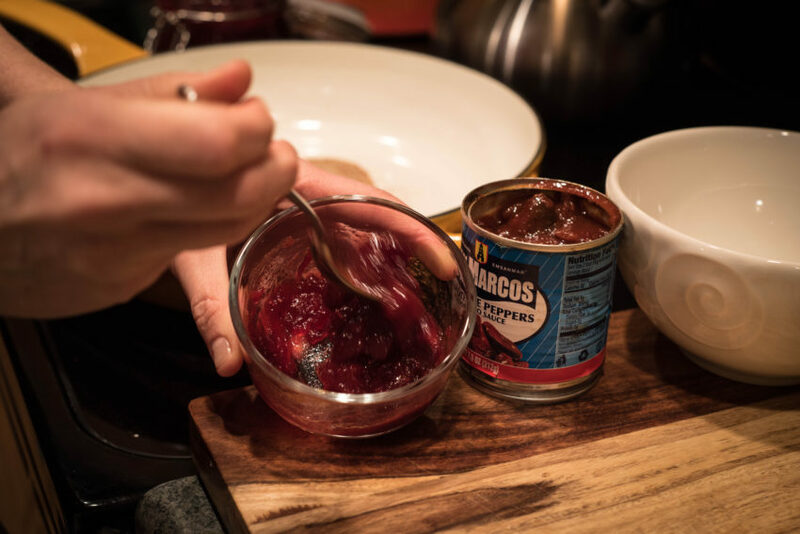 Take 1-2 tablespoons of cranberry sauce, and stir 1 teaspoon of the adobo sauce into the cranberry sauce. It gives it a amazing smoky flavor and a little kick. Lather this deliciousness onto the bread in the skillet. If you eat cheese, a slice of Provolone is like melted heaven. Provolone is the perfect mellow cheese for this kind of sandwich, because it doesn’t flight with any of the other flavors, and melts beautifully. And lay on slices of turkey…Thanksgiving turkey or otherwise. Or chicken. Or ham. It’s all good. Next, pile on some greens. I had chopped kale on hand, but spinach would be good too. 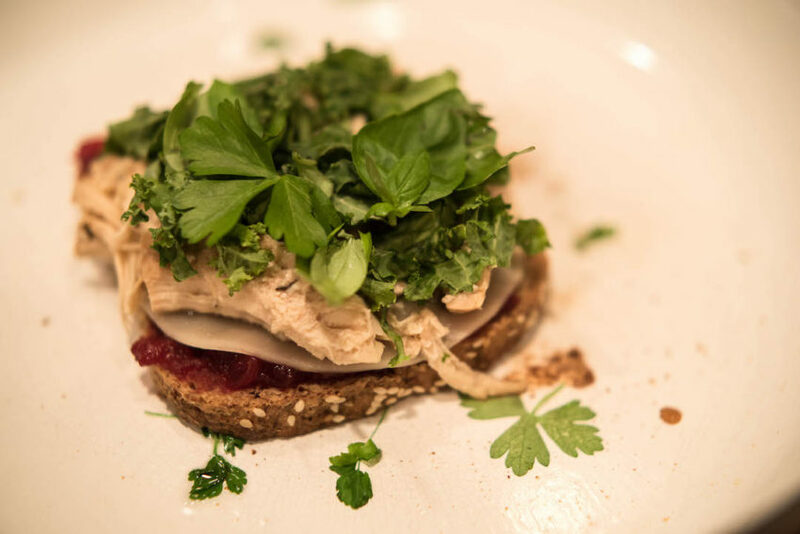 I love to find ways to use fresh herbs that include other things than just sprinkling them on top of a finished dish. It’s post-Thanksgiving, so I had flat-leaf parsley, basil and some sage on hand. I put a few leaves of each on top – except for sage, which is exceptionally strong, so just a few slices of one leaf of that. 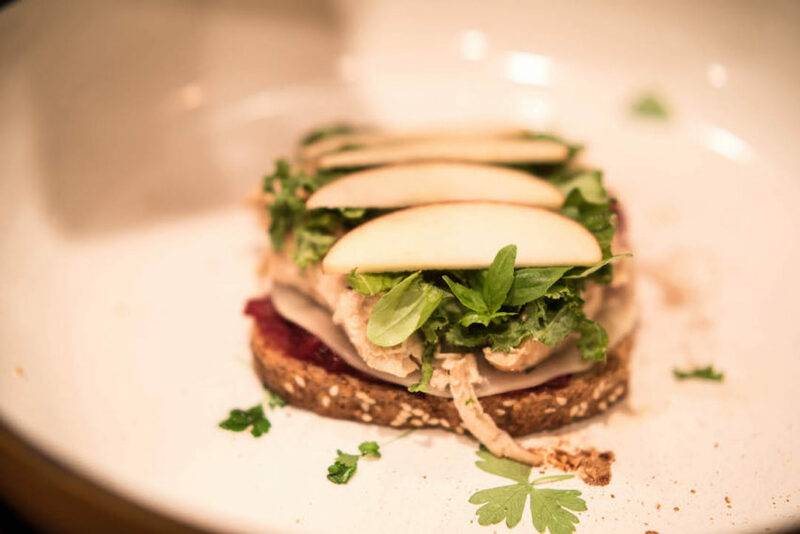 And because this is the best-autumn-sandwich EVER, some apple slices offer a sweet crunch that contrast the tang of the cranberries in a delicious way. 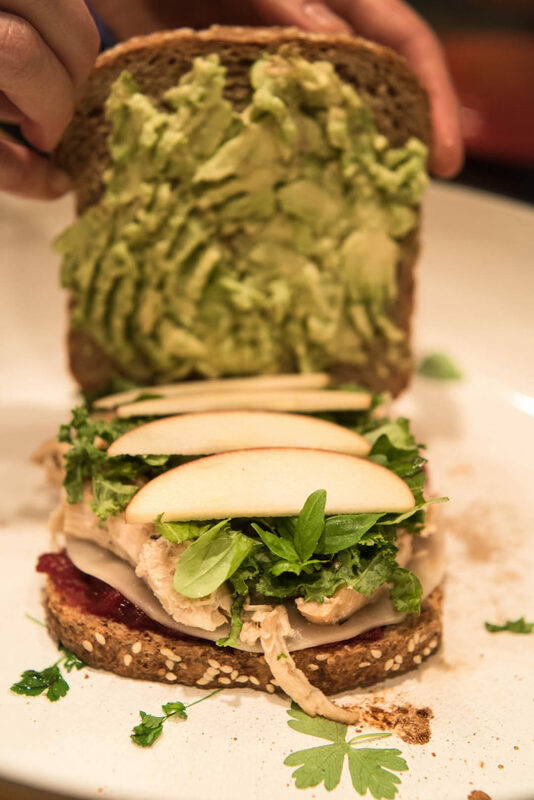 I love Gala apples for this sandwich, because they are sweet and consistently good. 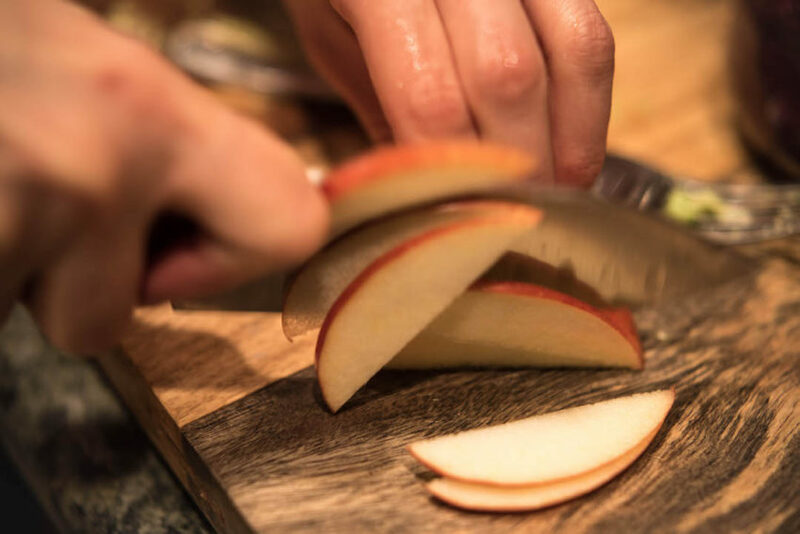 Slice off one side of the apple, and then thinly slice it. Leave the skin on…because a good amount of nutrients and fiber are in the skin, and then it takes less work. Which is a good thing. 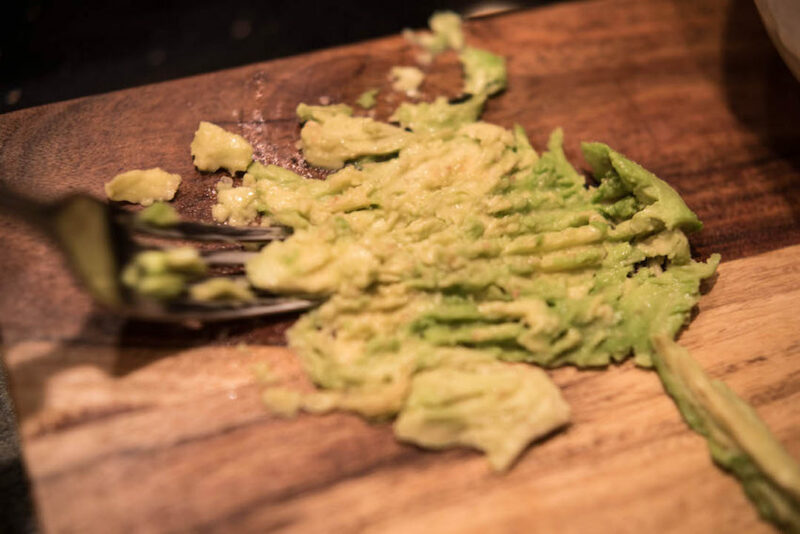 Then, mash up 1/4 of a ripe avocado. Sometimes I’ll mash it right on the bread, and other times I mash it on the cutting board. Either way, a ripe avocado gives a rich creaminess. No mayo needed. Sprinkle on a little sea salt, and put it on the top of the sandwich. 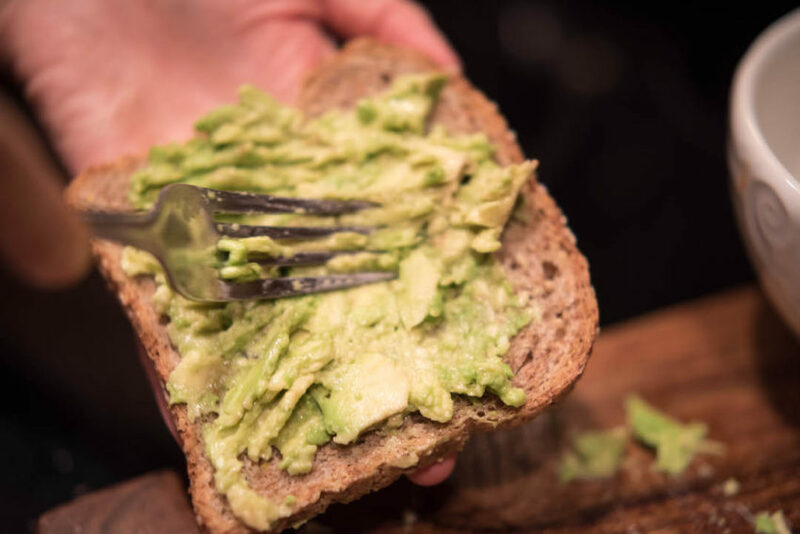 Sea salt intensifies the flavor of avocado. Admire the tower you created. 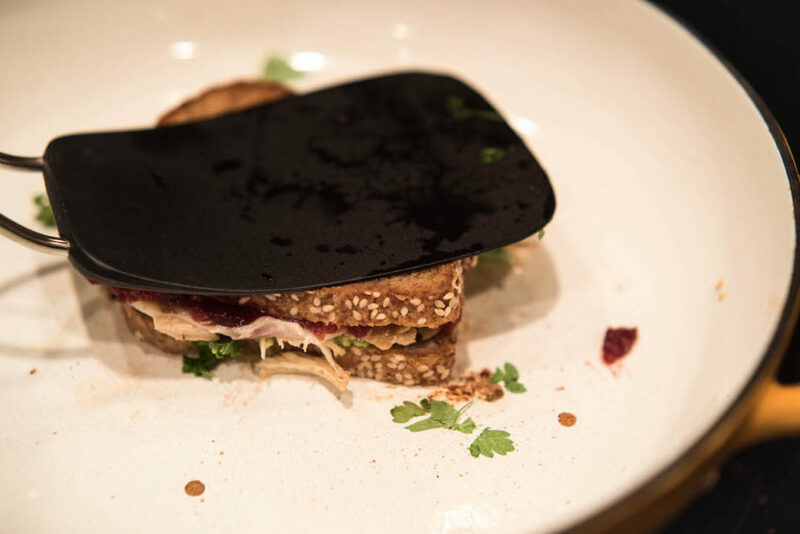 I do not have a panini press (not a fan of items that only have one function in the kitchen…unless they are small and really useful), so I make this in a skilled and press the sandwich down with a spatula. 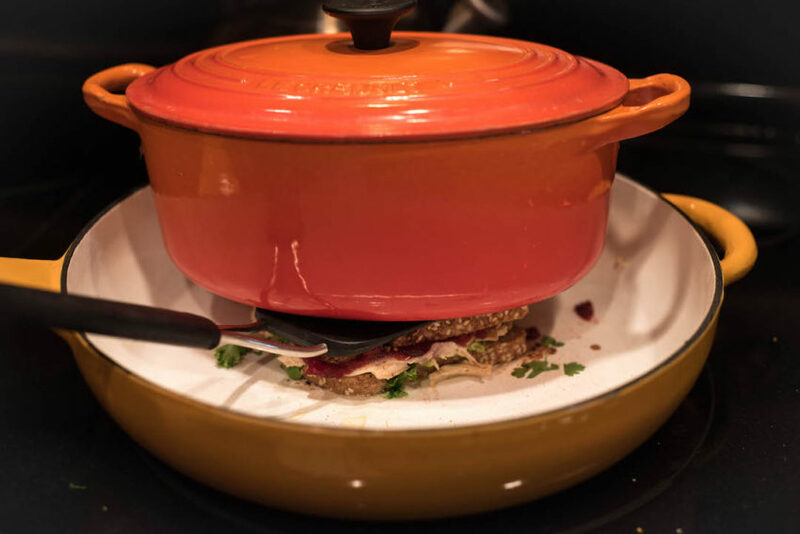 To get it smashed even more, put an iron pot or skillet on top, and watch the flavors mash together….yum. 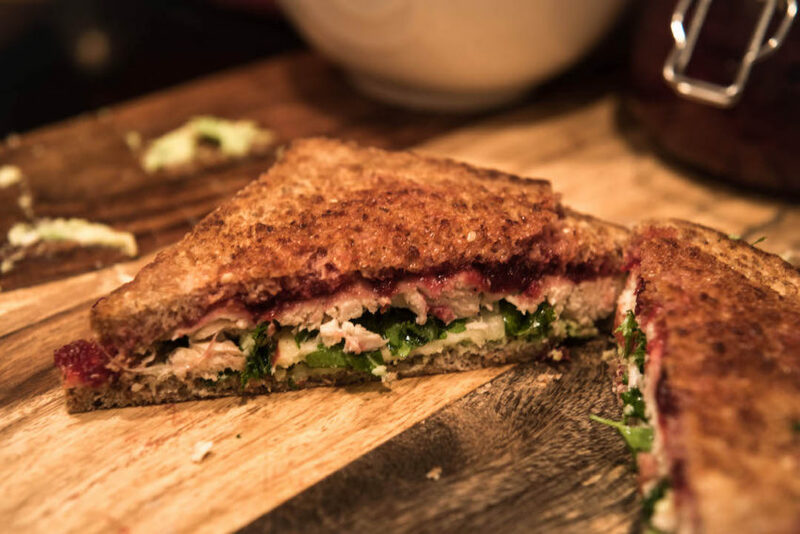 There is something about a pressed sandwich. Oh….also! 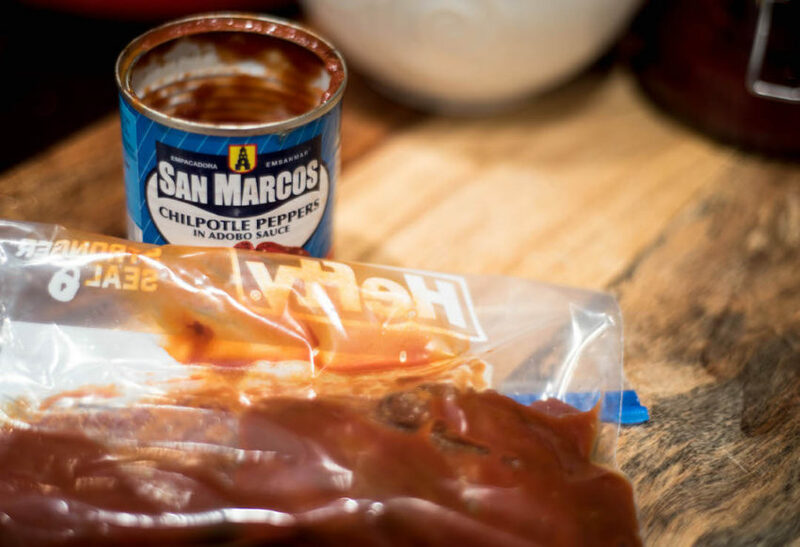 Chipotle peppers are SO strong, you would only use a little bit at a time (we are talking a teaspoon or so). So put the rest of those peppers and that delicious sauce in a freezer-safe bag, and freeze it for future use. Happy beginnings of the holiday season! 1. Heat a skillet to medium, add coconut oil and swirl over pan. 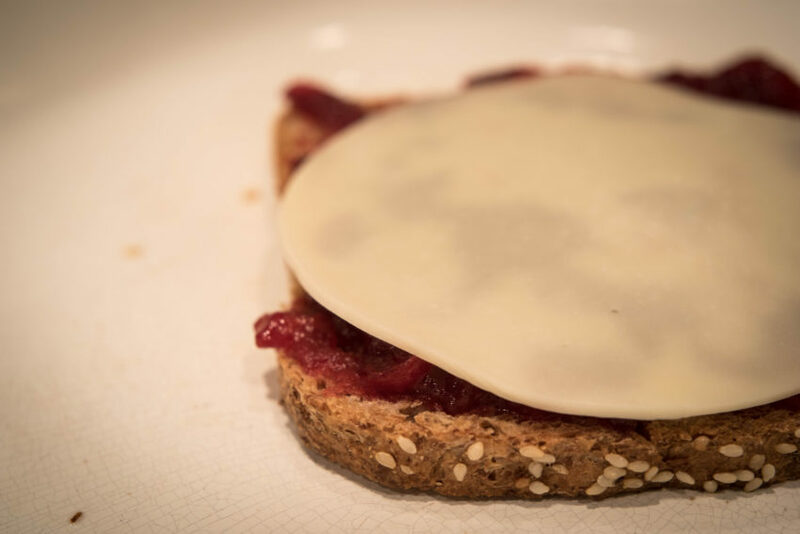 Lay 1 slice bread down, letting it toast on one side while you make the rest of the sandwich. 2. In a small bowl, mix cranberry sauce and chipotle adobo sauce. 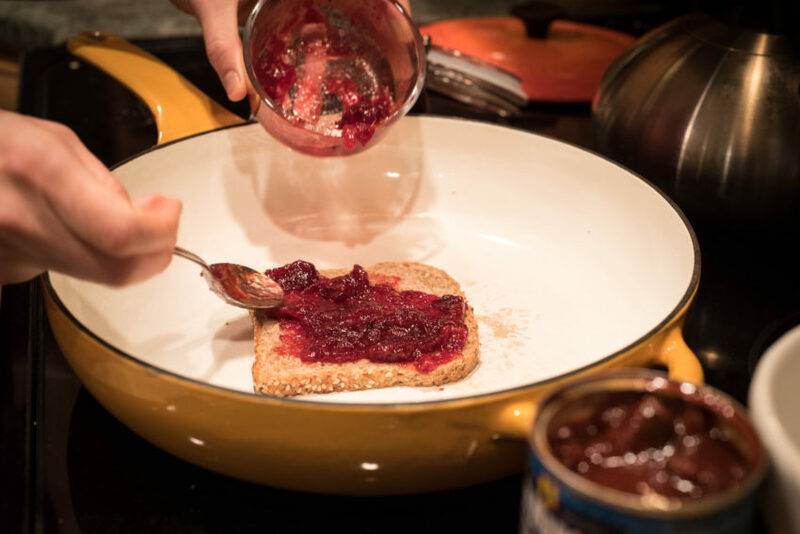 Spread on top of bread in the skillet. Add Provolone cheese. 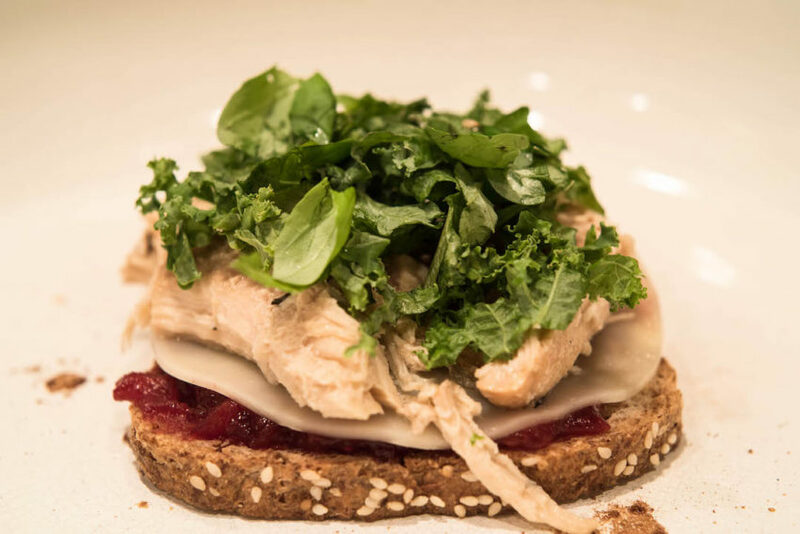 Then layer on turkey, handful of greens, any fresh herbs, and thinly sliced apple. 3. Mash avocado on other slice of bread, and sprinkle on salt. Place bread avocado-side down on top of sandwich, pressing down. Flip sandwich over and press down again, letting the other side of sandwich toast, the cheese melt and the ingredients get hot. Use an iron skillet on top of sandwich to encourage the pressing:) Toast sandwich in the skillet about 2 more minutes or until golden brown. 4. Remove, let cool slightly, then slice and devour!